If you ever dreamt of getting close to nature, Emdoneni Lodge with Cheetah Project & Spa is the place to visit! 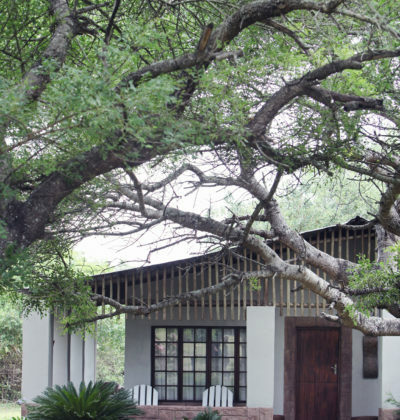 Close to the National road (1.5 km), Emdoneni Lodge is accessible for any visitor who still wants to experience the luxury of a bush environment and also be close to the main attractions such as Hluhluwe/iMfolozi Game Reserves (23 km) and St Lucia World Heritage Park (from 30 km away). This intimate multi-award winning lodge is the ideal location from which to explore the wildlife and coastal reserves in Zululand. Nature lovers & enthusiasts will appreciate the abundance of our wildlife and the scenic splendours of this rich and diverse region during game drives offered at Hluhluwe/iMfolozi Game Reserves, guided and non-guided walks done at the lodge, cultural excursions close by and relaxing boat cruises at Lake St Lucia. Our passionate and very knowledgeable guides cannot wait to introduce you to our region! Emdoneni Lodge offers guests elegantly decorated, intimate and comfortable accommodation in Hluhluwe in chalets and/or rondavels, on a bed & breakfast or dinner, bed & breakfast basis. There are mainly showers in the rooms, with the exception of two rooms which do include baths. WiFi is available, free of charge, to all our guests. The accommodation is enhanced by facilities which encourage our guests to unwind, relax and enjoy the tranquil lodge surroundings, including a boma, swimming pool and sky deck. Walk with the wildlife including Zebra, Impala, Nyala and Red and Grey Duiker. The bird life in Zululand is also abundant. The surrounding area is renowned as a mecca for bird lovers. Some of the specials one might go in search of are: Narina trogon, Blue Crested Lourie, Mangrove King Fisher, African Broadbill, Pink Throated Twin Spot, Blue Billed Fire Finch. Come and be mesmerised by the beauty of the Caracal, enchanted by the playful Serval, astonished by the speed & agility of the Cheetah and delighted by the African Wildcat… We offer educational tours daily, Monday to Sunday with a feeding during the afternoon tour only. ALL tours to the Cheetah Project will be FREE of charge during the duration of your stay when you book, on DBB directly from our website and not through an online travel agent. It is impossible to run out of things to do in this little slice of wilderness heaven. Some of the activities at Emdoneni Lodge are visiting the cat centre, taking nature walks amongst the animals, join a game drive to the Game Reserve or book an activity for the kiddies whilst pampering yourself at our Spa! If you feel like a day out to explore the surrounding areas, there is plenty more to do. Visit the Hluhluwe Game Reserve (around the corner from us) or Mkuze Game Reserve and take a game drive in search of the elusive and famous Big Five. If its Zulu culture and education you’re after, then visit the Zulu Cultural Village. Those of you in search of water-based activities have the option of visiting any of the following: Lake St Lucia, Cape Vidal Snorkeling Safaris, Sodwana Bay, St Lucia Wetlands, Jozini Dam and Kosi Bay. Spacious and elegant chalets with an authentic atmosphere to maximise comfort. Each chalet has an en-suite bathroom (shower only) and a lovely view on the garden. Two chalets adjacent to each other with a split patio. 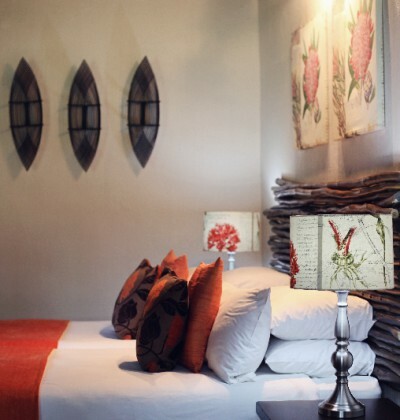 We offer twin beds or king size beds with an en-suite bathroom. Tea and coffee making facilities are also available in all rooms. This unique African-style, round, thatched roof is called a rondavel. The unit consists of two bedrooms, each with its own bathroom (with shower only). Each unit has an adjoining door between the two bedrooms, making it ideal for families. The rondavels have a view over the garden and it is in close proximity of the swimming pool and restaurant. The units are elegantly decorated with an authentic atmosphere. Extras: Air conditioners, ceiling fans, bar fridge, as well as coffee and tea making facilities. 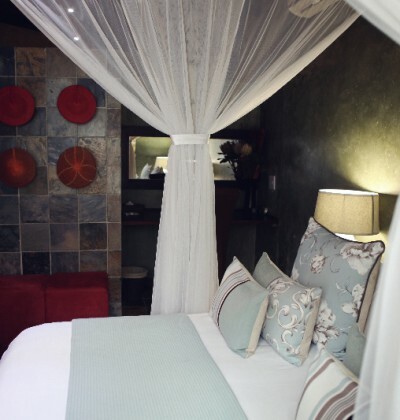 The Honeymoon Suite, Windfall Cottage, is privately situated under Marula trees and offers great comfort and privacy. 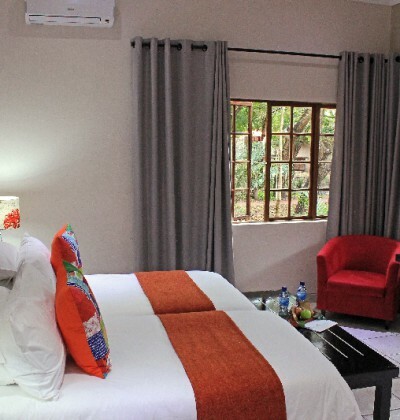 It consists of a lounge with DSTV, romantic bedroom, en-suite bathroom with a free standing bath, leading to an outside shower in a privately fenced Boma area. 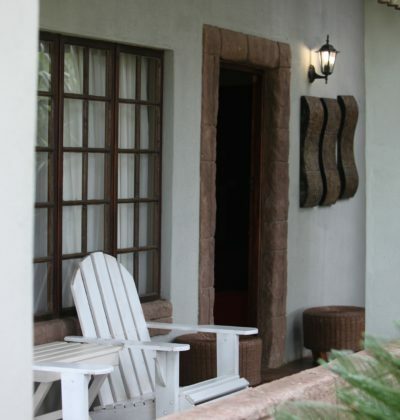 Sit and relax on your private patio, having your morning coffee or tea. In the afternoon, enjoy a glass of wine and watch Zebra, Nyala and Impala roam around the cottage. Ideal for honeymooners or for those looking for a romantic weekend away.